Among the stars and starlets of the 40s and 50s, it was easy for Gloria Grahame to get lost in the shadow of more prominent figures like Humphrey Bogart and Lauren Bacall. Hell, it’s even likely that you had barely heard of her before you knew about this film, but the Oscar-winning actress who graced the frames of films including It’s A Wonderful Life, Oklahoma!, and The Bad and the Beautiful (for which she won that award), still had a theatrical presence about her that carried her all through life even after her career waned significantly – or at least, that’s how it appears to be in Film Stars Don’t Die In Liverpool, a light but effective drama that focuses exclusively on the final few years of her life. We begin in Liverpool 1981, when Grahame (Annette Bening) collapses just before a theatre performance, citing “gas” or indigestion as the cause. Her former lover, the much younger actor Peter Turner (Jamie Bell), is informed, and he brings her back to his parents’ house where she is tended to be his mother (Julie Walters) until she is well enough to get back on her feet. Flashbacks show their brief but tempestuous affair a couple of years prior, which despite the significant age difference seems to have been quite special for both of them, but even that is threatened by the real cause of Gloria’s health problems, which Peter must come to terms with if he is to give the woman he loves a proper send-off fit for a Hollywood star. It’s a fairly low-key movie, taking place mostly in just this small part of Liverpool where Grahame is staying with Turner’s family, with the more extravagant moments taking place in these extended flashbacks. Often, especially when it does transition into those earlier scenes, it feels like you’re watching a meticulously crafted stage production, which given how theatricality plays a big part in this particular story, makes a great deal of sense that it is presented this way. Director Paul McGuigan uses these surreal narrative cues and transitions – which he likely picked up from his stint on several episodes of Sherlock – to the film’s advantage, since they highlight how much this particular story, and the people involved in it, already feels very theatrical right from the offset. Its old-fashioned approach to storytelling, and sometimes even how McGuigan shoots the film, is a call back to the kind of movie that Grahame would have starred in all those years ago, where she would have endured a fluffy on-screen romance that in some way ended with tragedy, but it would have had a powerful emotional core to it that showcased her true talents. Her theatricality plays a big part in her character here, and Bening does wonders in showing how Gloria Grahame used it to charm her way into the lives of those around her. The way that the character is written, it feels like she is giving a performance in every second she is alive, even when she is just alone with Turner or other people she doesn’t have a strong a personal connection with. Speaking in a ditzy Marilyn Monroe register of voice most of the time, which tends to falter whenever she loses her rag or doesn’t exactly get her way, she retains the deer-in-the-headlights mannerisms of a young and naïve starlet even in her darkest and most tragic moments, something that Bening uses to give a strong and captivating portrayal of someone who clearly loved what she did, and did whatever she could to remain in her own theatrical bubble until life makes it burst. The scenes she shares with an equally-as-good Bell are heart-warming because you do buy their chemistry and why they would be attracted to one another despite the noticeable age difference, which can lead to some really effective moments of drama later in the film which highlight why both are regarded as truly great actors. The film is so light and fluffy, however, that it feels immediately disposable once you’ve watched it. Though the drama is well-acted and made competently, there’s not much that’s worth revisiting unless your mother or grandmother is eager to watch it, and even then the substance tends to wane a little bit for you. The intentions are definitely strong, but it doesn’t make for particularly thrilling entertainment outside of a rainy Sunday afternoon and there’s nothing else showing on television – however, if that’s what you’re in the mood for, then by all means check it out whenever the weather outside is frightful, as the song goes. 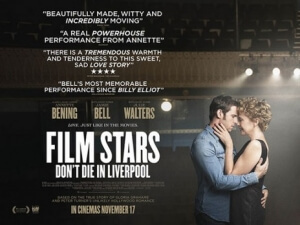 Film Stars Don’t Die In Liverpool is a light and fluffy account of the final few years of Gloria Grahame’s life, but while the acting is strong – particularly from Annette Bening – and the filmmaking is delightfully retrospective, it feels entirely disposable once you’ve seen it, leaving little room in your memory for it afterwards.